The newsletter went out a few hours ago. Hope you enjoy! If you're a subscriber and didn't receive it, or if you subscribed too late, email Ashwini and she'll sort things out (check your spam folders first though!). Also, I did a video interview with the Australian Romance Readers Association a couple of weeks ago, and the video is now available on their Youtube channel. Just FYI - we do talk spoilers for Heart of Obsidian so if you haven't yet read that, save this interview to watch later. I also talk a bit about Shield of Winter (from around the 6:20 mark to approx 12:40), if you don't have time to watch the entire interview). For Guild Hunter fans, I talk a bit about Archangel's Shadows from 26:25 to 30:40ish. 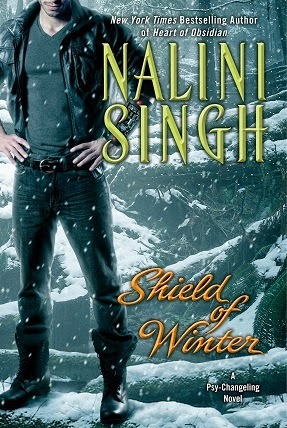 Newsletter goes out in approx 15 hours with another full-chapter excerpt of SHIELD OF WINTER! (Signup form on front page of my website if you aren't yet a member of this fantabulous monthly newsletter ;-)). Also, I haven't forgotten the Kaleb/Sahara short I promised you all - will be working on that this week. Hoping to post next week. A book rec for you today! Much as I adored Meljean's Guardians series (which by the way is now complete), I think her Iron Seas adventures are becoming my favorites of her books. 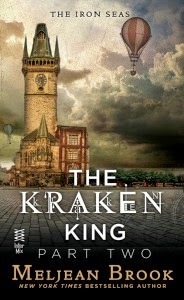 The Kraken King is the newest book in her Iron Seas world. The interesting thing is, this book is being released in serial form, with a new episode releasing each week (each of the episodes is around approx 80 pages I think). But don't panic if you hate serials - the entire book will be released in one go once all the parts are complete. So you have a choice to read it in installments or wait for the full book. I'm not usually a serial format reader (too impatient! ), but I decided to try this because (1) Meljean! (2) I don't have too much reading time at the moment, so these bite sized pieces are perfect, and (3) The heroine of the book, Zenobia, writes serial adventures herself, so this seemed the perfect way to read her story. I finished Part I last night and I loved it!! The chemistry between Zenobia and Ariq is intense and raw and just delicious. 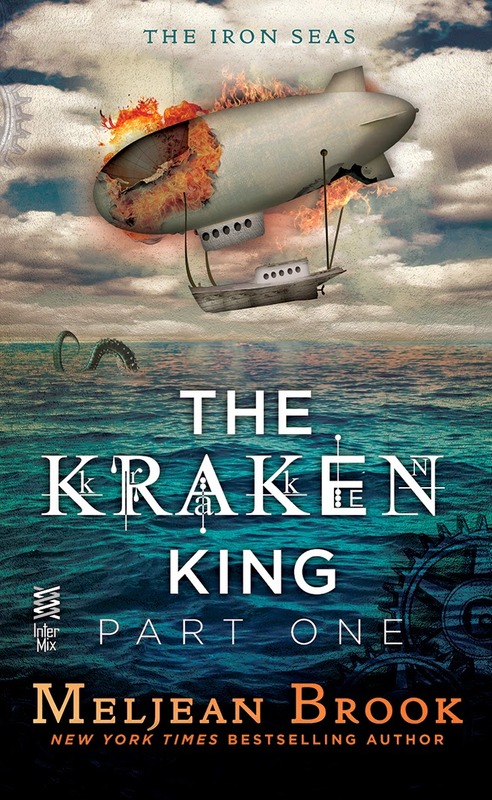 The world Meljean describes, with her Krakentown created of the hollowed out metal shells of sea monsters, her airships and more, is so well realized and so unique. Here's the link to the excerpt for Part I on Meljean's site. Do check it out even if you think this isn't your type of read. You might be happily surprised! I can't wait to read Part II, which I've also downloaded. Now, of course, I have to resist the urge to e-mail Meljean and say, Give me the rest now or else I'll loose the kraken on you! Are any of you following this story? What do you think so far? If you are a Meljean fan, which of her books would you recommend to newer readers? The epic 13th installment of Singh’s bestselling contemporary paranormal romance series will be eagerly devoured by series fans and new readers...The broad scope and urgency of the plot combine with sweetly subtle and intimate character interactions in a powerfully written story that stands well on its own. Yay for Ivy and Vasic! Here's the link to their full list of books. And don't forget, the April 29th newsletter will have another full chapter of SHIELD OF WINTER (in which Ivy and Vasic come face to face for the first time). First full chapter excerpt is available on the website. If you're not a newsletter subscriber, signup form is on the top right of my website. Make sure you click the confirm link sent to your email or you won't be subscribed. Once you do, you'll get an automatic Welcome newsletter with short stories that aren't yet up on the website. Any problems, email Ashwini (nalini DOT assistant AT gmail DOT com (replace the DOT and AT with . and @). Time to talk books! What are you reading and loving this holiday weekend? *Open to the public and tickets can be purchased for just the Giant Book Fair (you can buy at the door or pre-order your ticket). Tonight's dessert. Had to share! Only the second time I've had the red kiwifruit. 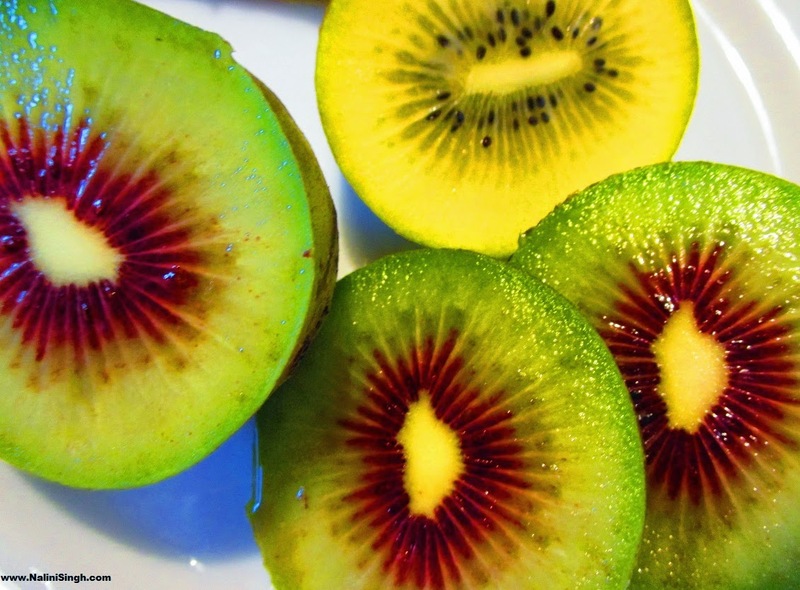 I put a golden kiwi next to it for contrast. Both were yummy! The Friday Book Club is now open! I've had a special request from a reader who wondered if everyone could share their top five favorite series, so please give her some good recommendations! And also, let us know what you're reading this week. News about the Psy-Changeling novella I mentioned a while back! Bastien's story will be in the NIGHT SHIFT anthology later this year. Bastien is Mercy's oldest brother, first seen in BRANDED BY FIRE. Check out the amazing lineup! New York Times bestselling author Nalini Singh delivers a smoldering story with Secrets at Midnight, as the scent of Bastien Smith’s elusive lover ignites a possessiveness in him that’s as feral as it is ecstatic. And now that he’s found his mate, he’ll do anything to keep her. In #1 New York Times bestselling author Ilona Andrews’ novella, Magic Steals, when people start going missing, shapeshifting tigress Dali Harimau and jaguar shifter Jim Shrapshire must uncover the truth about the mysterious creatures responsible. From Milla Vane—a warrior princess must tame The Beast of Blackmoor to earn a place among her people. But she quickly discovers that the beast isn't a monster, but a barbarian warrior who intends to do some taming himself. It’s seer Makenna Frazier's first day on the job at Supernatural Protection and Investigations, and her first assignment is more than she bargained for when bodyguard duty for a leprechaun prince’s bachelor party goes every which way but right in national bestselling author Lisa Shearin’s Lucky Charms. Amazon paperback pre-order already up (Thanks Shayera for the heads up). And it's also now available for pre-order on Kindle and Itunes. Ebook & more paperback pre-order links to come as they go live. Monday mid-morning in New Zealand, and I'm obsessively working on ARCHANGEL'S SHADOWS. Things are afoot! Hope you all had a good weekend! (Some of you are probably still in the weekend, so hope it's going great). It's book club time! What are you reading and loving this week? Thank you to everyone who took part in the contest - we had an amazing number of entries! I've notified the winners through their email addresses. Congratulations! 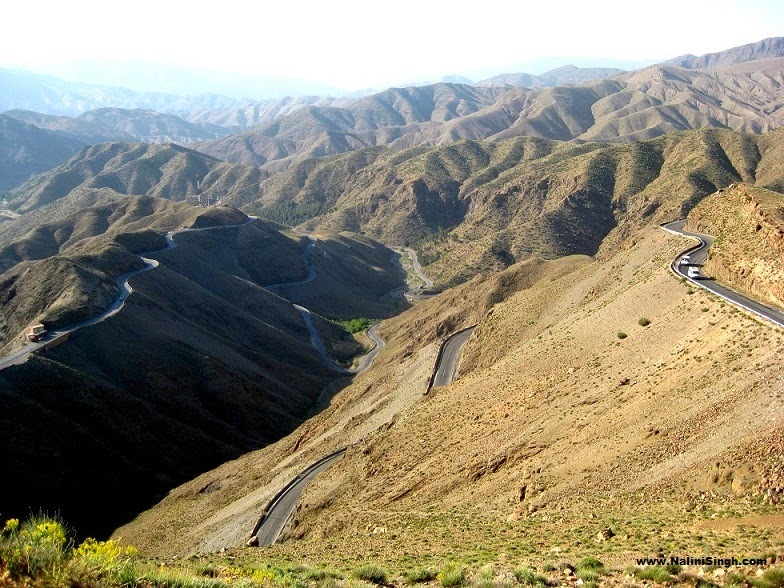 I took this in the High Atlas Mountains in Morocco. I love how the roads ribbon through the mountain range, and the sky is so clear. The vehicles to the right give you an indication of the scale of the landscape.